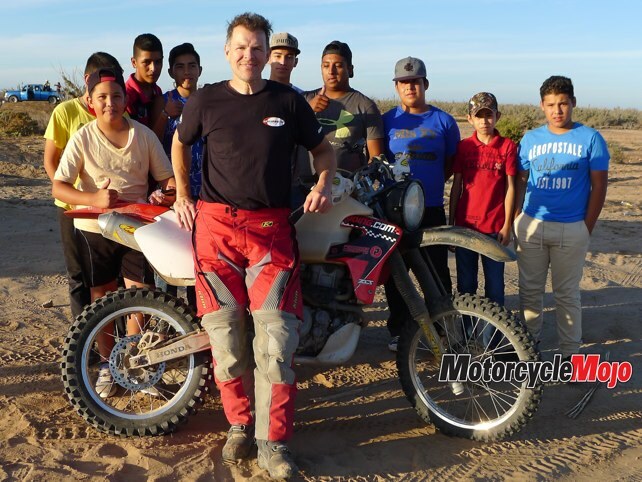 “Baja favours no one.” I remembered fellow Pikes Peak racer Carlin Dunne’s words well as my Honda 450 bounced off the rev limiter on a dusty mountain road leading out of Ensenada. 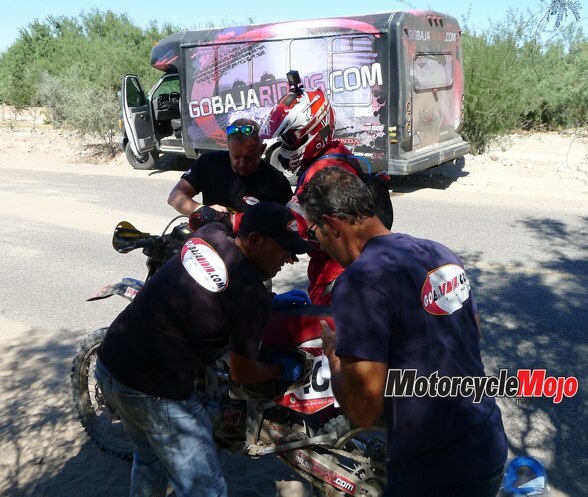 My first section of the 2017 Score International Baja 1000 was to get our team GoBajaRiding.com Honda CRF450X from the start, in downtown Ensenada, to my waiting teammate a couple of hours away in the mountain village of Ojos Negros. 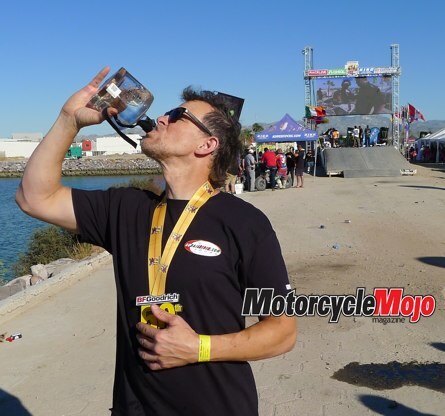 Our race started at 12:45 a.m. on November 17. The racecourse out of town was lined with locals partying it up – loud music, bonfires, cheering and flashing lights. It’s a pretty chaotic scene for a dirt bike racing through the night. 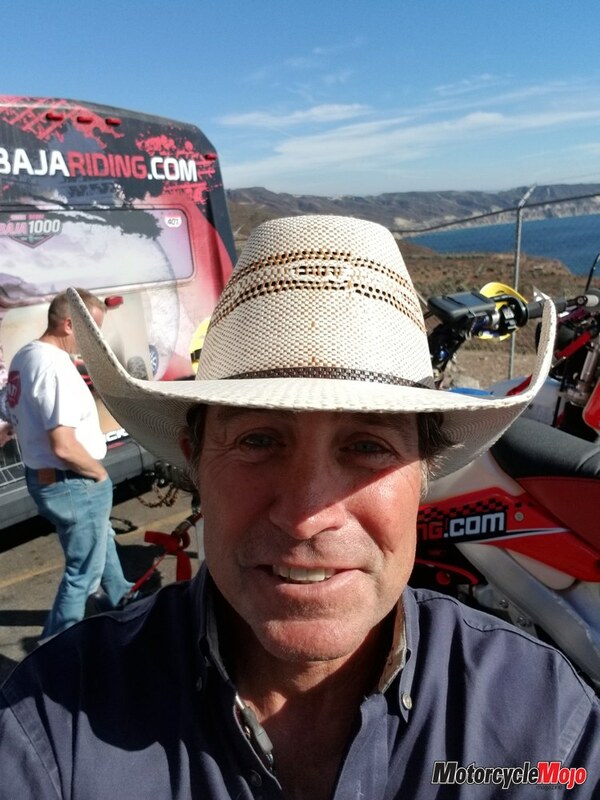 Our team entry for this 50th Anniversary Baja 1000 was an effort of Bruce Anderson from Riverside, California, a six-time Score Baja Series Champion. 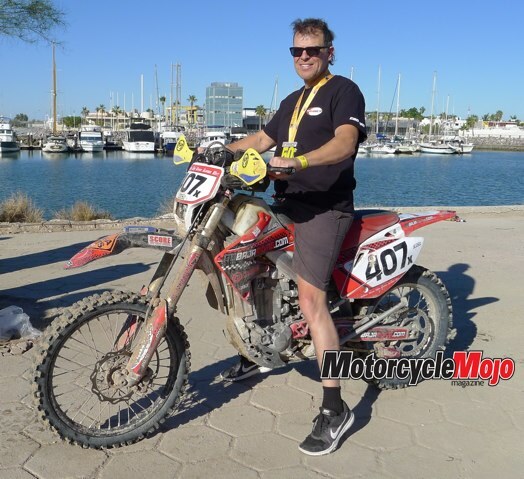 The rest of our team were Baja rookies: Tony Wilkinson, 45, from Kelowna, B.C. ; Matt Weber, 48, out of Delafield, Wisconsin; Scott McCune, 55, from Rockport, Texas; Marty Heitmann, 54, from South Okanagan, B.C. ; and me, Shane Scott, 53, from Moncton, N.B. 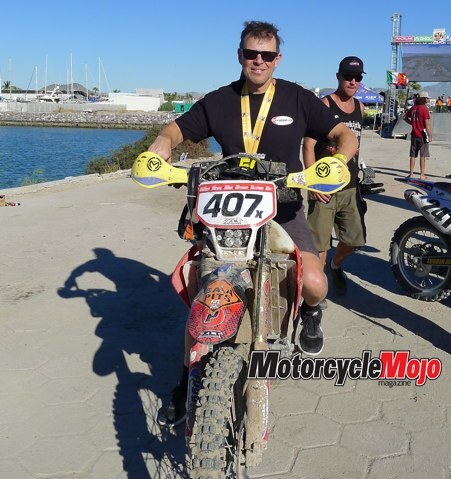 We were entered in the Pro 40 class because of Anderson’s record, but as a twist of fate, he broke his leg in a pre-run crash. 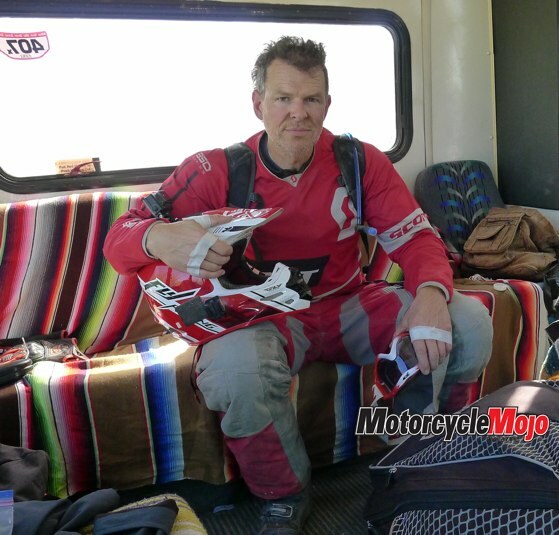 His riding talent would be missed. Anderson is a well-known fixture in Baja, and the owner of GoBajaRiding.com, a bike and buggy tour company. He knows the peninsula like the back of his hand. And he soldiered on, broken leg and all, to manage our team along 1,134 miles to the finish. 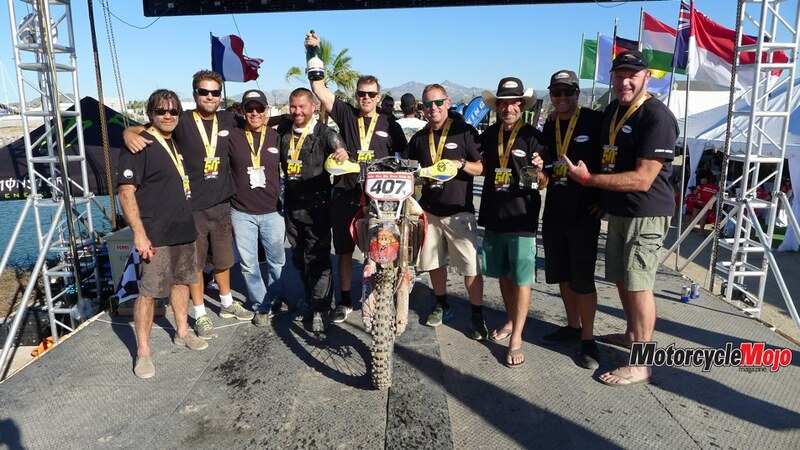 Over the next 37 hours, our team handed off the same bike to each other 18 times for two- to three-hour stints, plus 26 pit stops for gas, air filters, headlights and tire changes, and we rode through 154 checkpoints and 20 speed-limit zones. Time penalties are added onto a team’s finishing time for being off course or for speeding in towns. Our team finished with no penalties. My second section started at race mile 131 at 5 a.m. 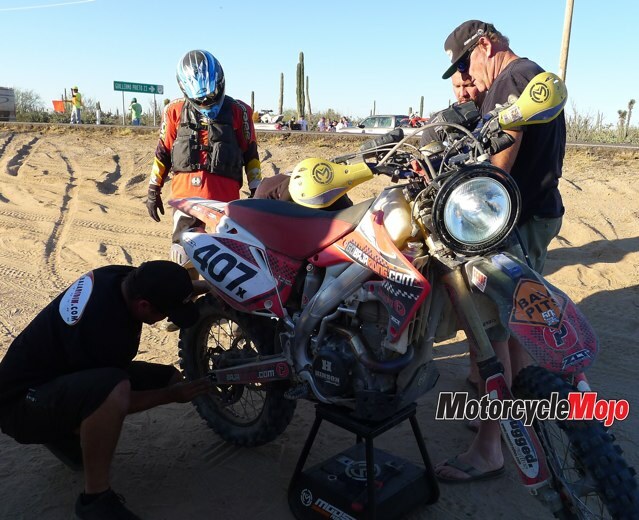 The crew quickly fuelled up the bike and changed the air filter; there were a few bikes that had already failed due to a clogged filter. The dust was brutal. 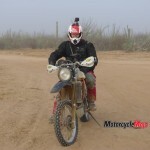 I worked a speed zone down the San Matias Highway for a few miles, then veered off-road for the rest of the section. It was just a gnarly stretch of endless tight and deep whoops with a smattering of boulders just looking for a front rim to crush. Over the previous four days, our team rode the entire course to familiarize ourselves with the terrain and make a plan for the race. I ran this section 20 per cent faster than in the pre-run, and in the dark handed the bike to Wilkinson, who then disappeared into the night. So far, we were beating our plan. My third section was Baja at its best, tearing through a beautiful wash valley in the midday heat. 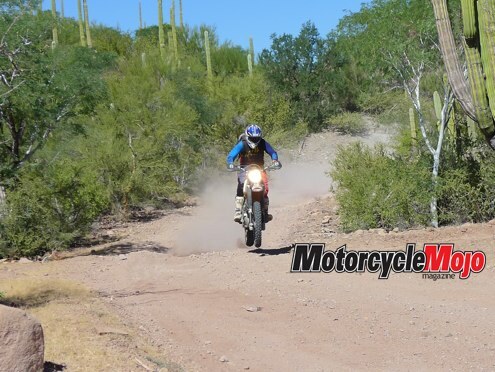 I started to get some desert riding skills down, skipping lanes side to side to rail outside turns, floating over loose rock beds, staying on top of the whoops, blasting through silt beds, etc. The riders who grew up in this terrain are truly impressive. 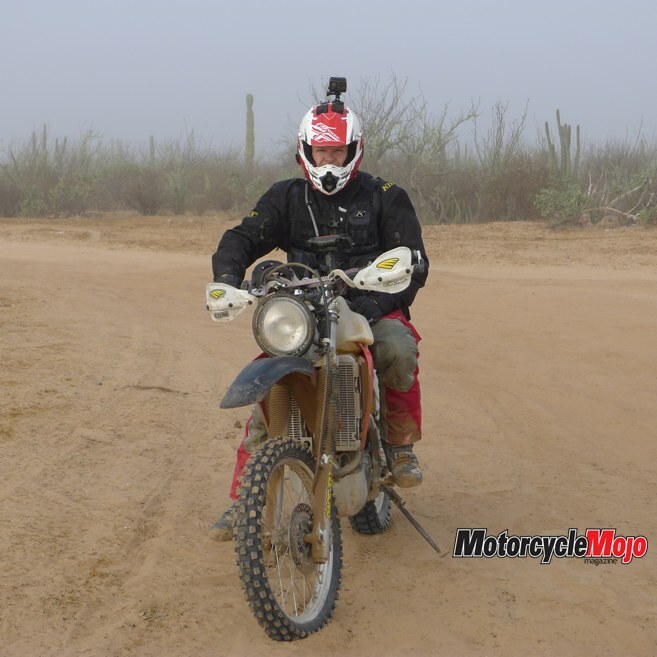 My fourth section was just a world of hurt, 58 miles to Loreto from 12:45 a.m. to 3:15 a.m. Words of wisdom from the team captain were “Just survive this.” Lots of rocks and plenty of sand with a happy helping of silt. Silt is like fine baking powder. The silt beds can be bottomless, so the rule of thumb is, “just pin it and never let off.” The crew had mounted the big dual 8” Baja lights, giving tremendous light. The downside was that they are very heavy and it takes some muscle to navigate this slow, technical terrain. My broken collarbone was reminding me it was still not healed. The 800-plus horsepower Trophy Trucks were catching me at that point and passing. The first hint of one approaching was the black desert night suddenly lit up like white noon with a trillion lumens of LED. Next was the unmistakable growl of the most pissed-off-sounding race engine on the planet. Team orders were “Never look back, get off the course!” Seconds later, they would rage by and leave me blinded in a swirl of sand, only made worse by my own light beams bouncing back off the plume of dust. There was nothing to do but stay still and wait for it to settle enough to start moving. It was an eerie kind of thrill. The last mile of this section was a steep rocky uphill that winds back and forth up the mountainside. I was too exhausted to stand up anymore and I could barely feel my hands. But I floundered to the top and soon rolled into our pits to hand the bike over to a waiting McCune. My fifth and final section, a 90-mile, 2.5-hour rip along the Pacific coast in perfect weather was a race highlight. It was definitely my favourite section of the race. I mostly enjoy fast and flowing high-speed stuff that calls on bravado more than talent. This section delivered. The Honda was tapped out often. Catching long, low air off some of the hill crests was the game of choice. Crowds of locals all along the racecourse were cheering racers, partying and camping – a pretty cool scene. Taking quick glances over at the killer surf roll into the pristine beaches just put this experience over the top. 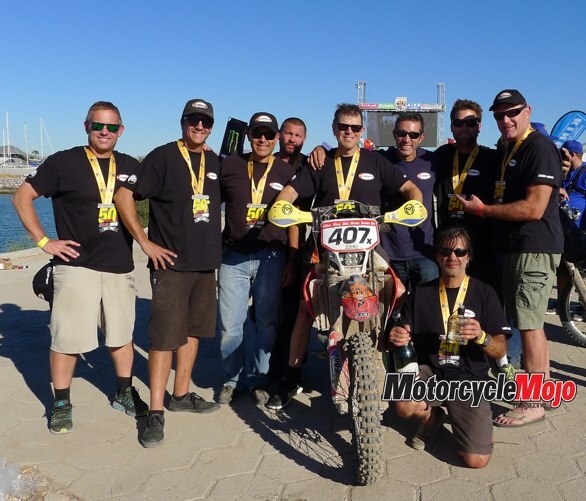 This race is a huge deal in Baja California and the estimated spectator numbers along the racecourse are over 400,000. I had keen eyes on a lookout for cows and such wandering onto the course, which is common in this section, and has really messed up some racers in past years. A few times I backed out of the speed, not wanting to be the guy who crashed our team out of a finish this close to the end. Around race mile 1,100, I spied Wilkinson and pulled over for a quick rider change. He roared off to bring it home 1.5 hours later.